Bring the raspberries and sugar to the boil in a covered pan. Reduce the heat, simmer for approx. 5 mins. Pass the mixture through a sieve, return to the pan, reduce for a further 5 mins., leave to cool. Transfer the raspberry sauce to a piping bag with a round nozzle (approx. 4 mm). Mix the flour, sugar and salt in a bowl. Add the butter and rub together using your hands to form an even, crumbly mixture. Add the egg, mix quickly to create a soft dough – do not knead. Transfer the dough to the prepared tin, press down, cover and chill for approx. 30 mins. Melt the chocolate and cream in a thin-sided bowl over a gently simmering bain-marie, stir until smooth, set aside. Using the whisk on a hand mixer, beat the eggs, sugar and vanilla sugar for approx. 5 mins. until light and fluffy. Stir in the cream cheese and lemon juice. Fold in the chocolate mixture using a rubber spatula, spread over the base. 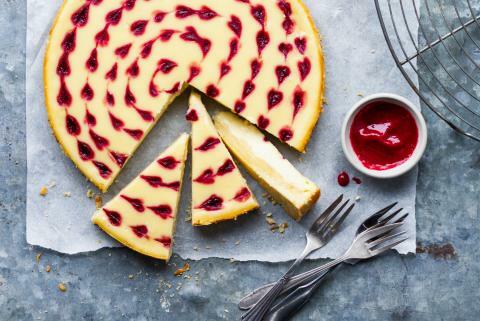 Pipe dots of raspberry sauce on to the cheesecake mixture in a spiral design. Drag a wooden skewer through the middle of the dots to create hearts. Approx. 1 hr. in the lower half of an oven preheated to 160°C. Remove and allow to cool slightly. Remove the tin frame, transfer to a cooling rack and leave to cool.